Very nice template. All images are easy to edit. Resposive version is very pretty. Great template. I needed something fast for the mobile app that just got released and we had trade show coming in within next 3 days. For that money we coundn&#039;t ask for anything more. 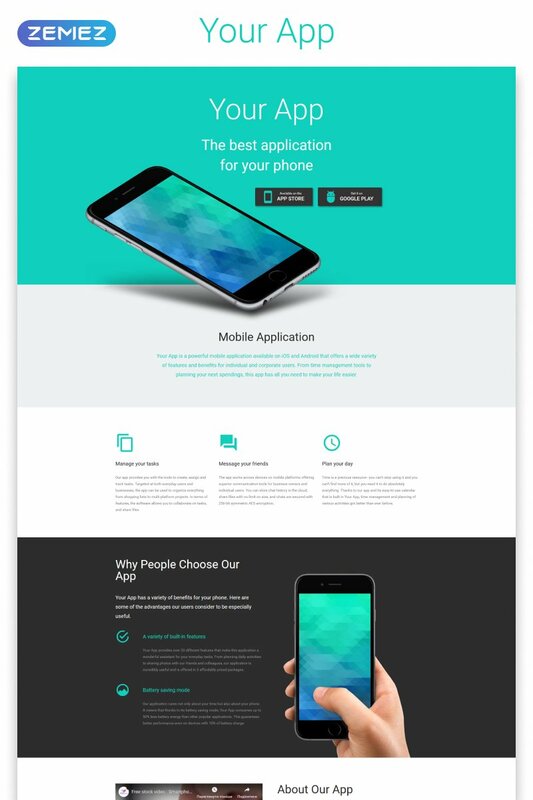 We got it working as a mobile app landing page and connected to the mobile app stores withing few hours. Thanks TemplateMonster! Definately we will continue using your services. There is simply no need to be sitting and writing the code for a week or 2, if you can have a ready to go template like this at that price. Good template for a simple website. Customization is not very easy though. Basic web-design knowledge is needed to modify the template. I found confusing the usage of web-fonts, since they weren&#039;t generic and usage was not well documented. Changing the icons of some sections required downloading new web-font from Google and installing it myself and heavily modifying two .css files. The animations and the script work really well across different platforms and screen sizes. Images misbehave when modified from what comes in the template, some additional coding is required for full customization. I am a gamedeveloper and needed atemplate for my app page. This one is great. Its easily changed to your needs and looks great. It even has some animations in it.